Purchase diesel electric generators for standby power for your enterprise. Good morning everyone. It has been a long time coming, but for the first time ever, Hurricaneville has scored an advertising deal. Late last week, the company Diesel Service and Supply approached our web site with a proposal to carry their banner ad on our special historic hurricanes page. By Friday, an agreement was made, and on Monday afternoon, Diesel Service and Supply’s ad was placed at the top of the historic hurricanes page as its sponsor. Since 2004, Hurricaneville has enjoyed tremendous success. Although this hurricane season has been somewhat of a tranquil one, the web site has still enjoyed a good deal of activity. At several points during the previous two years, 2004 and 2005, the site has seen up to 90,000 hits in a day. In 2004, the web site garnerned 1,255,000 hits over the six month period of the hurricane season including 910,000 hits during the month of September alone. Much of that was thanks in part to our coverage of the four Florida hurricanes: Charley, Frances, Ivan, and Jeanne. Then, of course, there was the 2005 Atlantic Hurricane season, which was just monsterous with 28 named storms, 15 hurricanes, and 7 major hurricanes. Four of those seven major hurricanes were Category Five Hurricanes including Emily, Katrina, Rita, and Wilma. Five storms from that season had their names retired including Dennis, Katrina, Rita, Stan, and Wilma. During the course of the 2005 season, which went all the way into early 2006, the site enjoyed tremendous traffic with 2,086,000 hits including 115,000 hits in June, which was 100,000 hits more than in June, 2004. Even November and December enjoyed busy months with over 100,000 hits in each month. July had 351,000 hits and October had 359,000. August and September combined was over a million alone although September, 2005 was several hundred thousand short of the year before. This season, has been well below those numbers, but still much more than early 2004 and the seasons 2000-2003. With the additional of the Hurricaneville Blogosphere and the RSS feed, new activity and interest has been generated. So far in the months covering hurricane season in 2006, the site has received nearly 727,000 hits including 146,250 hits in June, which is more than in June, 2005. August and September each had over 200,000 hits each. Keep in mind that the 2006 season has only seen nine named storms, five hurricanes, and two major hurricanes of Category Three strength or better. So the activity has been quite good and better than that of prior to the 2004 season. So, the additions of such things as the monthly book review, articles on hurricanes from the past, and the aforementioned blog and RSS feed have helped. Most importantly though, our site has appreciated all of you, who have shown great enthusiasm and devotion these past several years. It is a very important time not only with Atlantic Hurricanes, but with weather and climate in general. Not only are we in the midst of an active hurricane cycle, but also in a critical period in terms of the health of our planet. We hope that you all continue to use and enjoy the features and information provided on this site. Other companies, who are looking to promote themselves, are more than welcome to advertise on this web site. We’d love to help you, and have your business. So, please feel free to contact us for rates at gmachos@hurricaneville.com. Good evening everyone. Sorry that I’ve been away for about the past ten days, but I’ve been paying more attention to my school work as well as fall league basketball action for my high school basketball web site, GMC Hoops. However, I’ve just completed several new articles for the web site including two retrospectives on hurricanes from the 1996 season, and two on storms from the 2006 season. The two featured storms from the 1996 season that I wrote articles on for the site were Hurricane Bertha and Hurricane Fran. I mention in both articles that the 1996 season was a season that was during a time when the active hurricane cycle that we often hear a lot about in the news was in its infancy. As a matter of fact, the 1996 season had more major hurricanes than the hectic 1995 season. In addition, that season ten years ago had more landfalling major hurricanes with two if you count Hortense, which affected Puerto Rico. There were more landfalling storms period that year. With Bertha, Edouard, Fran, and Hortense, there were four storms that brushed the coast or came ashore in 1996. The season was a sign of things to come in the Atlantic. Especially on top of the fact, that Hurricane Opal helped close out the 1995 with a bang as the Category Three storm blew ashore near Pensacola as the O.J. Simpson trial reached its climax with the controversial not guilty verdict. The first two seasons of this recent active cycle had 32 named storms, 20 hurricanes, and 11 major hurricanes. Now, some ten years later, those numbers have grown to 167 named storms, 93 hurricanes, and 45 major hurricanes in a twelve season span (1995-2006). These storms also occurred during a pivotal time in my life. Early on in the summer of 1996, I was laid off from a System Administrator job that I had, and I decided to go back to school, and resume my studies. The first semester back, the Fall of 1996, I took a introductory course in Meteorology at the Cook College Campus of Rutgers University. The other two articles dealt with the present hurricane season, 2006. Two recent storms: Hurricane Ernesto and Hurricane Florence were not significant storms in terms of their intensities, but they were still notable in the sense that they were the first hurricanes of the season that both made impacts on land. Ernesto only was a hurricane for just twleve hours, but it made four separate landfalls including three along the United States coastline from the Florida Keys to South Florida to the southern shores of North Carolina. Florence was a stronger storm with 90 mph winds, and stayed at hurricane intensity for a longer period of time than Ernesto did. More importantly, the sixth named storm was the first hurricane to make an impact on the island of Bermuda in almost exactly three years. The last storm to affect Bermuda was Hurricane Fabian a major hurricane that was the worst storm to hit the island in fifty years when it pounded the island in September, 2003. On average, Bermuda gets impacted by a tropical storm or hurricane every seven years or so. In addition to these articles, which also have accompanying video footage, I’m currently working on a book review for the month of October. It will be a summary on the book, Windswept, by Marq de Villiers. My interest in the book grew when I noticed the author included brief passages on his daily tracking of Hurricane Ivan as the storm traversed the Atlantic prior to crashing ashore near the Alabama and Florida border in September, 2004. I really enjoyed the book, and found it to be a nice little weather supplement. The book talks about all kinds of topics dealing with wind and weather. Not just the obvious things such as hurricanes, thunderstorms, blizzards and tornadoes, but also things such as the layers of the atmosphere, the Beaufort scale, wind related sports such as sailing or hang gliding, and localized winds such as the harmattan, sirocco, foehn, and blue norther. I also plan to have an article on the historic Miami Hurricane of 1926. I read about it in the book, Divine Wind by Kerry Emanuel, and realized that this year was the 80th anniversary of the devastating storm. So, keep your eyes peeled for more stuff. Note: I have finished working on editing the four articles that I have written on two of the recent storms this season: Ernesto and Florence, and two storms from the past: Bertha and Fran. I will try to get these posted on the site very soon. Like I said on the home page, a lot has transpired since I last updated the site on Thursday afternoon. Unfortunately, a couple of things got into the way of me being able to keep things updated here. One, of course, was that I worked Thursday, Friday, and Saturday nights, and slept most of the daytime on both Friday and Saturday. The other reason was a problem that developed on my other site, GMC Hoops, that I had to act on as quickly as I could. Consequently, I wasn’t able to update the site until late Sunday afternoon although I had been following some of what was going on with Isaac through television and the web. I have to admit that I was quite surprised by the fact that this storm was able to blossom into a hurricane. Its close proximity to a front and its feeble state early on made it seem to me that this storm was going to have a tough time to say the least. However, this latest storm showed some true resiliency, and fortitude by battling through a hostile environment in the Atlantic with trough after trough leaving the East Coast of the United States. In addition, the storm has gotten itself in a position, where it is no longer a threat to the fish and ships as I originally posted, but also to portions of the Canadian Maritimes. Keep in mind that earlier this summer, researchers had discovered that sea surface temperatures off of the Canadian Maritimes had been running above normal this year. 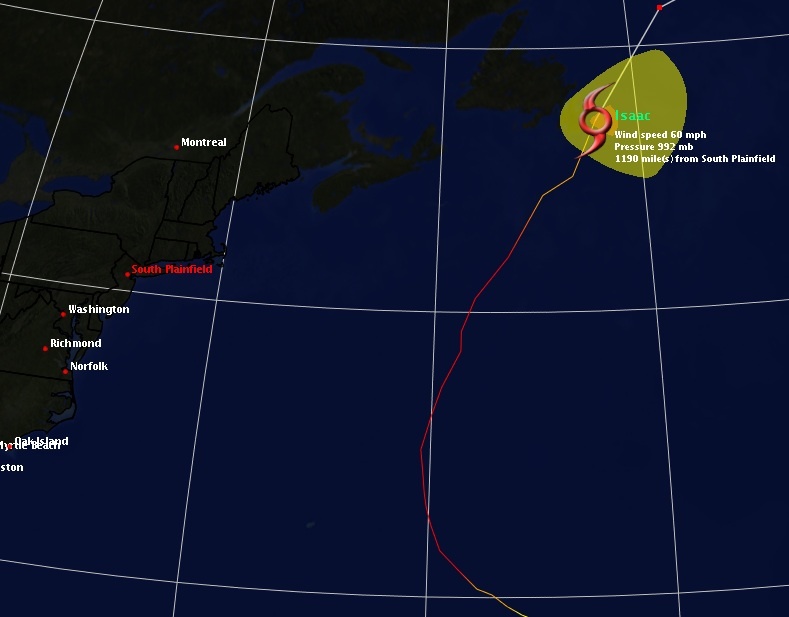 So, Isaac could very well menace Newfoundland as a hurricane. Regardless, a tropical storm watch is in effect for the Avalon Peninsula of Newfoundland including the cities of Cape Race and St. John’s. According to the latest forecast track analysis from the NHC, it appears that Isaac could brush the eastern portion of Newfoundland within the next 24 to 36 hours. It has been quite an active six weeks in the Tropical Atlantic. As I mentioned in my last article on Isaac, there had been six named storms to form in the Atlantic since August 20th. Of those six, five have gone on to become hurricanes. So far in 2006, we have seen nine named storms, five hurricanes, and two major hurricanes, which is on par for an average year. In addition, these numbers have surpassed levels attained during the 1997 season, where there was a total of nine depressions, eight storms, three hurricanes, and one major hurricane. Every depression that has emerged in 2006 has gone on to become at least a tropical storm.